While our age is often named as the visual century, the historical relevance of image migration is relatively under-studied. The “Migration of Images” panel will bring together scholars who can speak to the visualization of Muhammad in art books throughout Europe across centuries, geopolitics of exhibiting paintings and objects, and Bauhaus in India. This panel is organized as part of the Cornell Institute for European Studies’ “Migration” Series. With the polemics that was aggravated with the publication of the caricatures of the Prophet Muhammad, several questions about iconoclasm and the non-figurative art in Islam, the power of images, the freedom of artistic expression and the depiction of the Prophet in Islamic art were discussed. And yet, the central question as to the long history of the representation, namely iconography, of Muhammad in the West was left aside. In fact, this specific field has been studied mainly by historians, who focus on the different traditions and legends as well as the anti-propaganda and Christian ideology about the life of the Prophet Muhammad. It seems therefore that the study of the histories of the depictions of the Prophet Muhammad in the West, which is presented in this talk, could fill this vacuum and might shed light on the different approaches in the West towards Muhammad and Islam. The exhibition of Bauhaus and Indian artists that occurred in December 1922 in Calcutta was a fascinating moment in the history of modernism. It famously displayed works by Bauhaus artists working in Germany such as Paul Klee, Wassily Kandinsky, and Lyonel Feininger alongside modern artists from India such as Abanindranath Tagore, Nandalal Bose, and Gagenendranath Tagore. 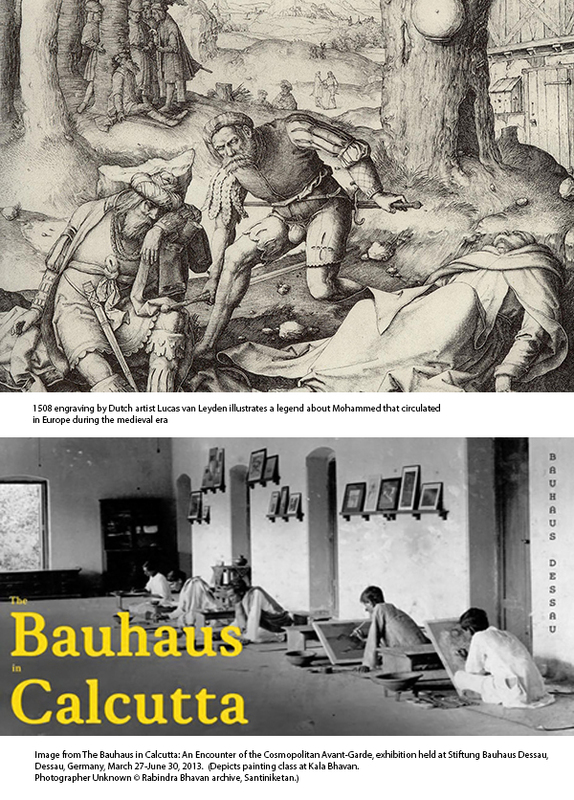 In 2013, a team of German and Indian curators reconstructed this historical event for a contemporary exhibition held at the Bauhaus in Dessau, Germany. My paper will offer an account of both the 1922 exhibition, for which there remains no visual documentation to this day, as well as the contemporary effort to reconstruct the show with original works of art from the era. The ambition and scope of the latter project, in particular, raises a number of critical questions related to modernism, cosmopolitanism and migration, the culture of exhibitions and the archive, and the operations of historical reconstruction and display. Avinoam Shalem is the Riggio Professor of the arts of Islam at the Columbia University in the city of New York. His main field of interest is in medieval artistic interactions in the Mediterranean basin, medieval aesthetic and the historiography of the field of art history. He has published over 100 articles in academic magazines and books and is the author of several books. Among his recent publications: The Image of the Prophet between Ideal and Ideology: A Scholarly Investigation (with Christiane J. Gruber, 2014); and Gazing Otherwise: Modalities of Seeing In and Beyond the Lands of Islam (with Olga Bush, 2015). He co-curated the exhibition The Future of Tradition: The Tradition of Future in Haus der Kunst, Munich (2010) and is currently directing the research projects When Nature Becomes Ideology: Palestine after 1947. Saloni Mathur received her PhD. in Cultural Anthropology in 1998, and is currently Professor of Art History at the University of California, Los Angeles. She is author of India by Design: Colonial History and Cultural Display (UC Press, 2007), editor of The Migrant’s Time: Rethinking Art History and Diaspora (Yale University Press/Clark Art Institute, 2011), co-editor (with Kavita Singh) of No Touching, No Spitting, No Praying: Modalities of the Museum in South Asia (Routledge, 2015), and co-editor (with Miwon Kwon) of Making Strange: Gagawaka + Postmortem, A Project by Vivan Sundaram (U of Washington Press, 2015).